This informational brochure talks about a new building to be built at the Berry Schools, dedicated to American mothers. Martha Berry writes about the money raised for the endowment at an event organized by Mrs. Hammond. 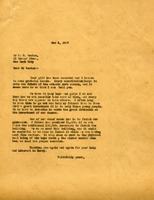 Martha Berry asks him to write Mrs Hammond, if necessary, for the donor's addresses. She apologizes because she knows Mr. Green needs running expenses but this money has to go to the Endowment fund. She also asks Mr. Green not to move into the new building until she returns. 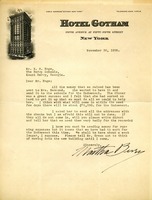 Martha Berry writes to Mr. Renton thanking him for his gift to the schools. Martha expresses her concern about figuring out how the Berry Schools can take care of the many boys and girls they have. Agnes, a Berry student, encloses $5 which is half of the prize that she won through Mrs. Clark to go on the new building.